Content by Tony Macklin. Originally published on September 2, 2011 @ tonymacklin.net. Sarah's Key is elevated by luminous performances by two actresses -- veteran Kristin Scott Thomas and 10-year old Melusine Mayance. Fortunately their talent often is able to transcend the contrivances that mar the plot. Vel' d'Hiv Roundup, in which 13,000 Jews in Paris and environs were taken from their homes and imprisoned in an indoor bicycle track and stadium. There they suffered horrible deprivations until they were split up and sent to transit and German death camps. This horrible action was done by French authorities and gendarmes. It wasn't until 1995 when French President Jacques Chirac finally apologized for French participation. The film, adapted by director Gilles Paquet-Brenner and Serge Joncour, flashes back and forth between two eras. Julia Jarmond (Thomas), an American journalist living in contemporary Paris, is writing an article on the atrocity in Paris, and as she assembles her information, we see Sarah in her heroic efforts to survive in the past. Director Paquet-Brenner probably makes a good decision in avoiding explicit horror. He limits it to a hurtling body, a gun-butting, a high-powered hose, and chaos. And reactions. The powerful music of Max Richter is an asset to the film's drama. Despite being captured, Sarah is committed to escaping and returning to their apartment to rescue her little brother. She is savvy beyond her years. Melusine Mayance, as the young Sarah, provides a beautiful mixture of innocence and guile. She is especially effective in the early scenes of the film. Kristin Scott Thomas is excellent as the journalist going through personal problems as she becomes obsessed with what became of Sarah. Niels Arestrup and Dominique Frot portray a very decent couple which adds humanity to the film. 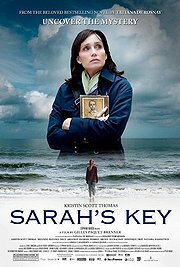 Sarah's Key also is a film that demands that one suspend his or her disbelief. Julia, who is doing a "ten page" article for a journal, is moving into the very apartment in Paris in which Sarah lived. It's been occupied by her husband's family since 1942. If you believe that one of 13,000 Jews happened to live in that very apartment, this movie is really for you. Once we learn the facts of the family, the movie falters. The motivation of Sarah, Julia, et al. is shaky. Sarah and Julia are both on quests, but their resolutions seem forced. The best scenes in Sarah's Key are the ones that emphasize humanity not incredible coincidence. One of the most human scenes is when Julia and her husband's father, alone in a car, talk about truth. The film should have ended with this kind of emotional effect. Instead, the ending of Sarah's Key doesn't resonate as it should. It's in a restaurant. We're left out to lunch.